On The indicator light comes on. Adjusts the seat temperature The further you move the dial forward, the warmer the seat becomes. The engine switch is in the “ON” position. The “ENGINE START STOP” switch is in IGNITION ON mode. Move the dial fully backward. The indicator light turns off. ●Use caution when seating the following persons in a seat with the seat heater on to avoid the possibility of burns: • Babies, small children, the elderly, the sick and the physically challenged • Persons with sensitive skin • Persons who are fatigued • Persons who have taken alcohol or drugs that induce sleep (sleeping drugs, cold remedies, etc.) ●Do not cover the seat with anything when using the seat heater. Using the seat heater with a blanket or cushion increases the temperature of the seat and may lead to overheating. ●Do not use the seat heater more than necessary. Doing so may cause minor burns or overheating. ■To prevent seat heater damage Do not put heavy objects that have an uneven surface on the seat and do not stick sharp objects (needles, nails, etc.) into the seat. 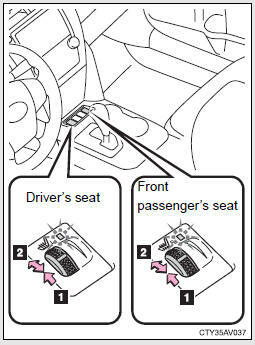 ■To prevent battery discharge Turn the seat heaters off when the engine is not running.